AMTA celebrates 75 years of success, and you get to be a part of it! Get ready to meet other massage therapists, students and recent graduates who are just as dedicated to the profession as you are. In order to ensure your AMTA 2018 National Convention experience is the best one yet, please review the information below. Start your AMTA 2018 National Convention experience with AMTA’s opening session and business meeting, featuring keynote speaker Bert Jacobs, co-founder, and CEO of Life is Good. Remember a badge is required. Review the class needs for your CE sessions. If you are unable to bring the required materials (e.g., massage tables, etc.) and want to choose a class that better fits your personal needs, you can switch classes on-site at the AMTA Registration Desk. If you bring your massage table, AMTA kindly offers you complimentary overnight table storage at the Marriott Wardman Park Hotel. Pick up the AMTA Show Daily every morning when you arrive at the Marriott Wardman Park Hotel. It includes classroom numbers and other up-to-date information to help you navigate the AMTA National Convention. Get the AMTA 2018 National Convention App, it’s free on the app store! This is another way to stay organized throughout the convention. You can find room numbers, a convention center map, and a scheduling tool in the app. Have your ticket in hand when you approach a CE session, and be wearing your badge. Sign the attendance roster and turn in your yellow CE card (this will be returned to you at the end of the session). AMTA will report CE credits earned at the AMTA 2018 National Convention to state massage licensing boards. After the convention, check your AMTA member profile for an updated CE transcript. The yellow CE card with stamped sessions serves as a back-up for your records. It does not need to be submitted to your state board or to AMTA. Continuing education speaker handouts will be distributed outside of each classroom. If the speaker has authorized us, you will also have access to these on AMTA’s website. After seeing the Opening Session with Bert Jacobs, you will want to get a photo with him! His passion for optimism and giving back will get you in the right frame of mind for the 2018 National Convention. He will be in the Exhibit Hall on Thursday, August 9 at 11:00am to meet you. Get a chance to meet (and take a photo with) the Closing Session speaker, Sergeant Noah Galloway, on Saturday, August 11 at 11:45am in the Exhibit Hall. Sergeant Galloway will inspire you with his humility, perseverance, and dedication, ending the 2018 National Convention a high note. Don’t forget to wear your badge, or you will miss out on these exciting events! The Exhibit Hall Opening Night Reception will take place on Thursday, August 9, 5:30pm – 7:30pm—all registered attendees are welcome! Thank you to our presenting sponsor Massage Warehouse. 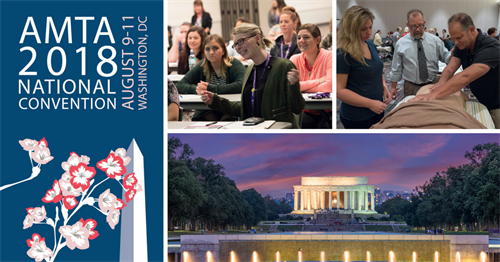 Then Friday evening, August 10, 5:00-7:00pm, join us as we celebrate AMTA’s 75th Birthday with a special reception and activities with the Washington, D.C. Chapter in the exhibit hall. Dinner Dance, sponsored by Performance Health will take place on Saturday, August 11, doors open at 7:00pm. Each full registration includes one ticket to Dinner Dance. Additional tickets may be purchased at the AMTA Registration Desk for $85. Check the weather in advance, but you can expect highs in the 80-90s in DC if you will be exploring the city in the evenings. Pack plenty of business cards for networking. Badges are required at all times. No one under the age of 16 will be admitted to the Exhibit Hall or classrooms. Professional photography and/or video recording are prohibited without advance, written permission from AMTA. No selfie sticks are allowed, as a courtesy to others. Before using any new product or service, make sure you are knowledgeable about the massage therapy scope of practice by checking with your state’s massage therapy regulatory authority. Any person engaged in disruptive behavior of any kind may be removed from the premises at the discretion of AMTA or the facility. Follow AMTA on Facebook and Twitter for photos and live updates—share your experience using #AMTAConv! Download the free AMTA 2018 National Convention mobile app to view education schedules, find social events, access speaker bios, navigate your way through the convention, and more.